Don Castro, Kim Wong, and Criena House in Red Flamboyant. Photo by Godwell Chan. BOTTOM LINE: A technically ambitious production employs aerial choreography, shadow puppetry, and masks to evoke epic myths while conveying the struggle to survive HIV and AIDS in modern-day Vietnam. Red Flamboyant has a lot going for it. The world premiere production was initially conceived when its playwright, Don Nguyen, read a 2006 New York Times profile of Pham Thi Hue, a real-life heroine whose Red Flamboyant Group is dedicated to providing services towards HIV and AIDS relief in Vietnam including the realistically grim yet mercifully tender goal that “when you die you are less lonely.” The subject matter itself is rich and thematically powerful. 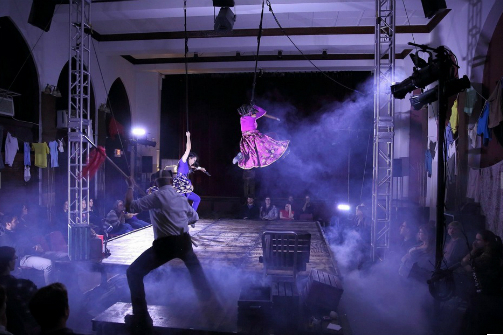 Add to that aerial choreography, fight choreography, masks, shadow puppetry, smoke, strobe lights, complex lighting, creative set design, theater-in-the-round, a venue in an Episcopal church, as well as a present-day narrative interwoven with the epic myth of the Trung Sisters (two Vietnamese heroines who led the first national uprising against the Chinese in 40 A.D.) and you either have a spectacularly chimerical piece of theatre, a chaotically ambitious production that comes up short, or something that falls somewhere in between. For all the technology and production work here, the theatrical accoutrements tend to detract rather than enhance and enliven Nguyen’s dialogue and storytelling. To put it succinctly and perhaps a little on the nose, Red Flamboyant, while admirable in its attempts at exciting storytelling, errs on the side of being a little too flamboyant. To an extent, what may have been intended as devices meant to elicit the mythic struggles inherent within the everyday, modern-day conflict seem superimposed rather than organic. Indeed, some of the sound cues and choreography, while evocative of Eastern traditional storytelling, occasionally and literally drown out the dialogue of the more rousing and dramatically poignant scenes. One scene in particular consists simply of a conversation between Mrs. Hue (Nancy Sun) and Diem (Don Castro), the Communist government official to whom Mrs. Hue appeals for humanity and funding. Within their exchange, the complexities and justifications for allocating funding among the needy becomes apparent, including deciding between those affected by the monsoons, those stigmatized by HIV/AIDS, and those looking directly “into the face of suffering” at all angles. While relatively low key, this scene made me sit up and take notice more than anywhere else in the production, and, ironically, I appreciated the magnitude of Mrs. Hue’s fight here more than anywhere else. Indeed, Red Flamboyant has a lot to offer in the way of storytelling. It suffers most, though, when the words are not given their due either in deference to or in contrast to the other aspects of the production. Mrs. Hue has a great story to tell, and my hope would be that the aerial choreography, lights, fights, and masks could support that story instead of smother it.